Followers of our blog will know that we’re big fans of travelling, whether it’s around Ireland or European City breaks, we like to get away for a few days and explore new surroundings. In 2015 alone we visited Paris, Barcelona, Madrid, Berlin, Valencia, Brighton, Manchester and various spots around Ireland. While it’s great to get away for a few days, sometimes there’s just simply no place like home, and in Newcastle that is exactly the case. We’re blessed in this part of the world to have some of the most amazing scenery in the world and an endless list of things to do. This weekend we decided to turn our typical quiet Sunday into a day of exploring as we set out to make a video highlighting just how good Newcastle is. Perhaps most famous for the Mourne Mountains (recently voted best view in the UK) and Royal County Down regularly voted the world’s best golf course, Newcastle is no stranger to tourism attention, both nationally and internationally. We set off on Sunday morning to take a quick stroll along the promenade and ended up having one of our most enjoyable days in quite some time in the town. Our first port of call was the promenade which was predictably packed for a bright sunny Sunday in February. 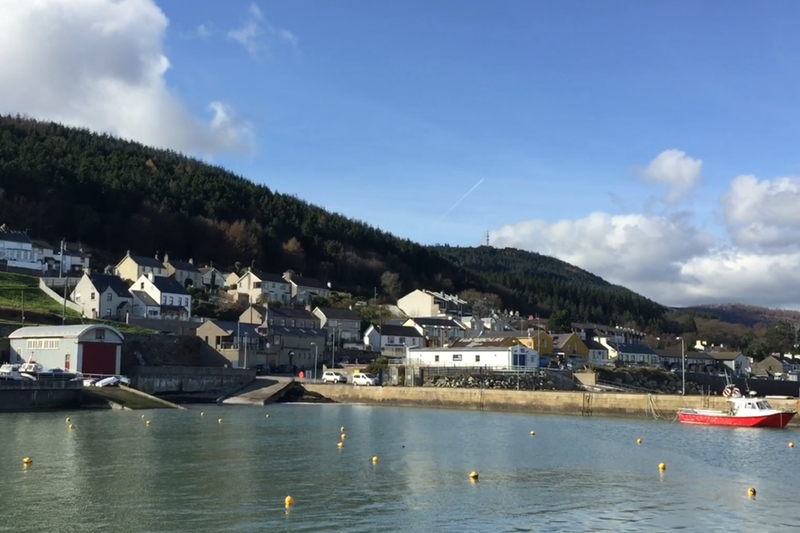 In fact, for the last Sunday in February we were pretty blessed with the weather and as a result, the town was jam packed with visitors and locals alike. We bumped into a couple of friends and this extended our day from a simple stroll along the shore to a day of exploration in Newcastle, which you can see in the video below. All too often we see visitors to Newcastle stop once they get to the spire and silver ball at the end of The Promenade. 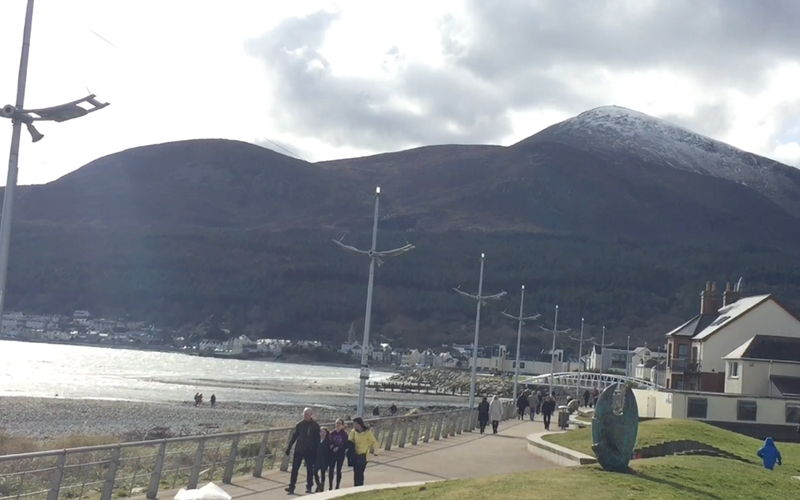 A quick photo of The Mourne’s and then a journey back up Main Street, usually grabbing an ice-cream along the way can be the journey for many. We live on up past Newcastle’s Harbour area and would strongly recommend visitors to the town walk on past The Promenade and take time to walk around The Harbour. If you are blessed with weather, the views are magnificent. If you’re feeling peckish following your walk, stop in at Olive Bizarre and grab a bite to eat, and if it’s a watering hole you’re after, Harbour House Inn and Mackins are popular with many. If you’ve taken the time to walk along the The Harbour, why not continue your journey on along the coast road until you come to The Bloody Bridge. 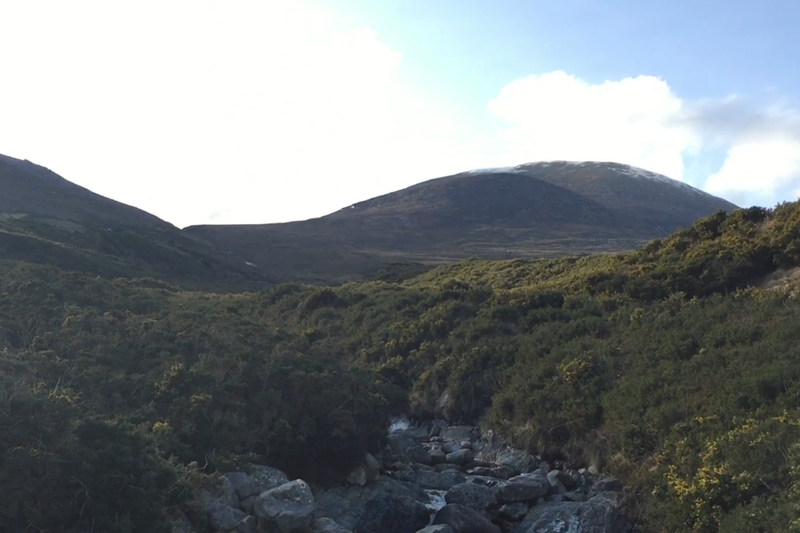 From here you can walk up into The Mourne Mountains and begin to walk along The Mourne Wall and Slieve Donard – take your hiking boots though as it’s quite a walk. The old quarry along the walk is a popular stop off for many on their walk along The Mournes and when you’re finished your walk, head back to Maggies Leap and find out all about the myth of Maggie, a young lady who jumped a deep chasm to get away from a man while carrying a basket of eggs – she didn’t even drop one when jumping. 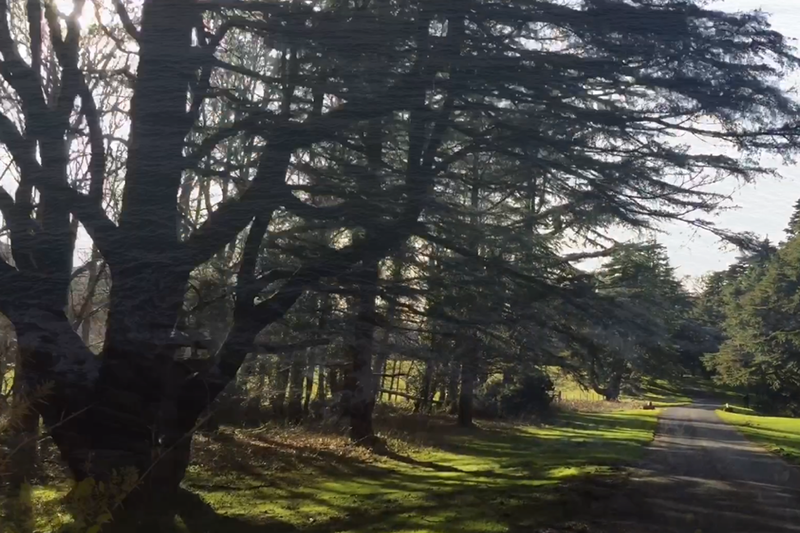 If you’re feeling full of energy you can walk from Newcastle to Tollymore Forest Park (although this could take an hour), or else jump in your car and take the short trip to the park which has been made famous in recent years thanks to its appearance in Game Of Thrones as The Haunted Forest. There is endless activities to do in Tollymore, from walking and hiking to running or cycling, there’s plenty to see and do in Tollymore. It’s ongoing popularity with locals highlights just how beautiful this part of Newcastle is. We recommend taking a stroll along Shimna River and explore the many outcrops, bridges, grottos and caves that make this area a little mythical and magical. A trip to Newcastle doesn’t have to be all activity. 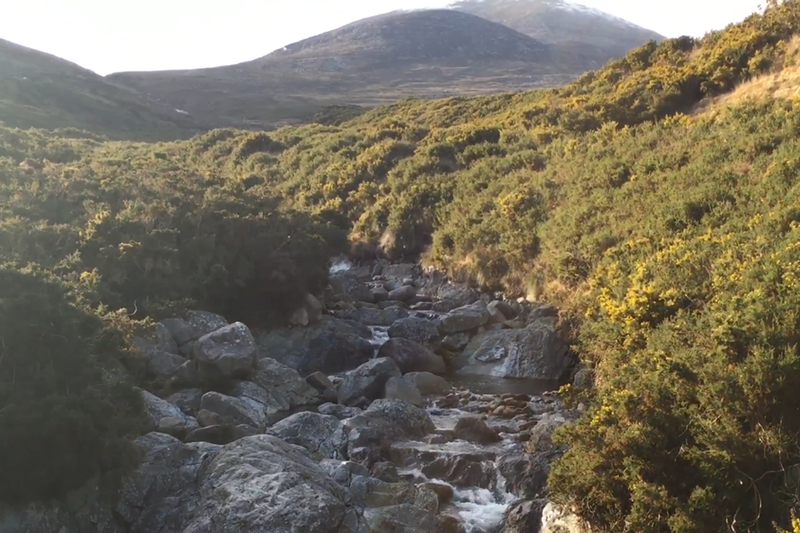 Sure, you have The Mourne Mountains to explore, Donard and Tollymore Park, Royal County Down and endless outdoor activities but there’s also plenty of time for R&R. 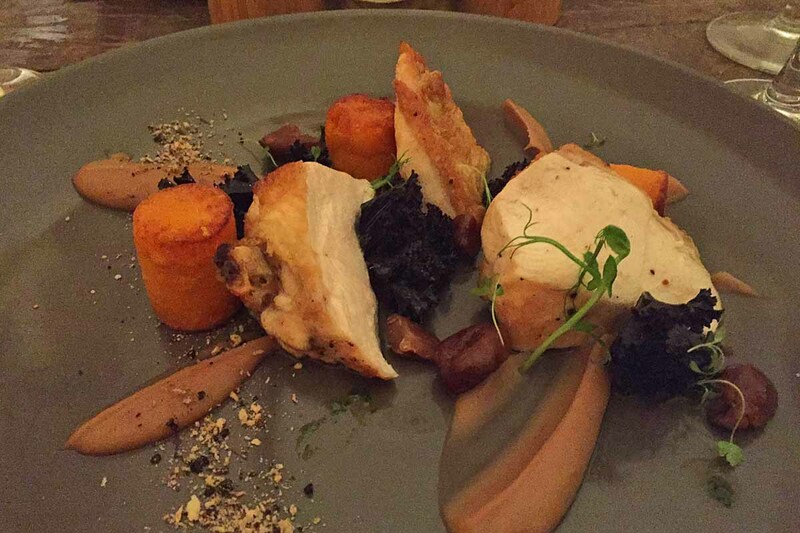 Food options are plentiful in Newcastle, from top class pub grub to fine dining, and everything in between, there’s no shortage of options – read our foodie guide to Newcastle for more info. Not forgetting the bars of course, with over 10 to choose from, you’ll never be stuck for a pint. Ice-cream shops are also big business in Newcastle, and you’ll not have too far to walk to get a poke (no laughing)! Newcastle and the surrounding area (including towns like Castlewellan, Dundrum and Annalong), has so much to offer. As residents we can often become oblivious to what is lying on our doorstep. We really enjoyed our day getting to know the town a little better, and look forward to getting out again and exploring other areas in greater detail like The Mournes, Castlewellan and Tollymore. We’ll be sure to share these experiences with you as well. Are you a resident or regular visitor to Newcastle? Let us know your favourite thing about the area by commenting below or connecting with us on Facebook and Twitter.